Ms. Inoue cares for all of our students, big and small. I would like to welcome back our school nurse, Natsuko Inoue to the SOIS Health Centre. Natsuko recently returned to work after a year-long maternity leave. The school nurse is in charge of assessing the health needs of our community. The nurse does a variety of jobs, from giving medical care to students bumps and bruises, to teaching the faculty the use of an epi-pen, a device to use in case of a severe allergic reaction. The health centre is a great resource for parents, teachers and students, especially those new to Japan, for those seeking medical attention in the community. Natsko is from Osaka and is a 2001 graduate of the Senri International School. She graduated from the Kobe Nursing College and is a certified midwife and she has licenses to be a public nurse and school nurse. Before working here in 2008, she worked as an operations nurse at a large hospital downtown. 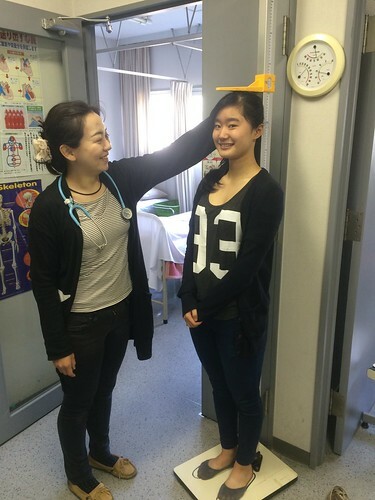 Ms. Inoue feels being the school nurse is special because she is taking care of students from both schools, Japanese and non-Japanese speakers, and they range in age from 4 to 18. She also enjoys helping faculty as well. Parents are encouraged to visit the health center and/or send her questions regarding health. She will be happy to help.